>NGC 6193 consists of the bright blue-white stars at the left and center of this image. The red glow that pervades the field is emission in the H-alpha line of hydrogen. The small bright patch with several stars near the darkest part of the nebulosity, to the right, is the infrared source IRAS 16362-4845. It marks a site where a small cluster of stars is present being formed. Credit: ESO. NGC 6193 is a large open cluster in the constellation Ara. It is about 3 million years ago and unusually rich in close binary stars. NGC 6193 forms the core of the vast Ara OB1 association of hot, young stars, which spans a full square degree of southern sky. NGC 6193 is embedded in a region of dense gas clouds and obscuring lanes of dust. The hottest stars of the cluster, two closely spaced O stars HD 150135 and HD 150136 (the brightest stars in the accompanying image), are the source of illumination for the emission nebula NGC 6188. HD 150136 is a remarkable binary system comprised of a two massive O stars (type O3 and O6) that are almost in contact with each other. Colliding stellar winds from the pair may be responsible for the prodigious X-ray emission emitted from this system. 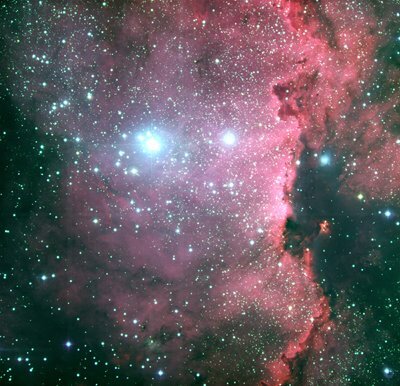 A likely evolutionary scenario of this region began with the formation of the older cluster NGC 6167 which is currently at the center of the expanding gas bubble. Powerful winds blasted from the first supernovae of this cluster produced the expanding bubble of neutral hydrogen gas. The expanding shell subsequently plowed into the surrounding interstellar medium, triggering the formation of the Ara OB1 association and NGC 6193 along the edge of the massive bubble some 1 to 3 million years ago. RCW 108 is a molecular cloud that is in the process of being destroyed by intense ultraviolet radiation from heavy and hot stars in the nearby stellar cluster NGC 6193. The designation RCW 108 refers to the inclusion of this object in "A catalogue of H-alpha emission regions in the southern Milky Way", published by three astronomers (A.W. Rodgers, C.T. Campbell and J.B. Whiteoak) in 1960. The dark dust that blocks much of NGC 6188's light was likely formed in the outer atmospheres of cooler stars and in supernovae ejecta.